Visit the Showcase Site to see sample chapters, get information on the supplements (including sample videos and online simulations), and much more. This shorter, essentials version of Berk’s best-selling Development Through the Lifespan, 6/e, covers the same topics and contains the same number of chapters, but presents only the essential information with an exceptionally strong emphasis on applications. 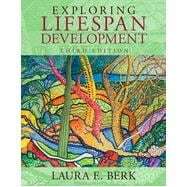 Exploring Lifespan Development includes all the features Berk’s texts are known for: Engaging writing style, exceptional multicultural and cross-cultural focus, cutting-edge consideration of the interrelationships between heredity and environment, rich examples, the most up-to-date research, and practical applications that help students relate the subject to their personal and professional lives. Authored by Laura Berk, MyDevelopmentLab for Exploring Lifespan Development engages students through personalized learning, and helps them better prepare for class, quizzes, and exams. It also helps instructors with course preparation, content delivery, and assessment. MyDevelopmentLab includes extensive video footage, multimedia simulations, “Careers in Development,” and interactive activities—all produced by the author and unique to Exploring Lifespan Development. Laura E. Berk is a distinguished professor of psychology at Illinois State University, where she has taught human development to both undergraduate and graduate students for more than three decades. She received her bachelor’s degree in psychology from the University of California, Berkeley, and her master’s and doctoral degrees in child development and educational psychology from the University of Chicago. She has been a visiting scholar at Cornell University, UCLA, Stanford University, and the University of South Australia. Berk has published widely on the effects of school environments on children’s development, the development of private speech, and the role of make-believe play in development. Her research has been funded by the U.S. Office of Education and the National Institute of Child Health and Human Development. It has appeared in many prominent journals, including Child Development, Developmental Psychology, Merrill-Palmer Quarterly, Journal of Abnormal Child Psychology, Development and Psychopathology, and Early Childhood Research Quarterly. Her empirical studies have attracted the attention of the general public, leading to contributions to Psychology Today and Scientific American. She has also been featured on National Public Radio’s Morning Edition and in Parents Magazine, Wondertime, and Reader’s Digest. Berk has served as a research editor for Young Children and a consulting editor for Early Childhood Research Quarterly. Currently, she is an associate editor for the Journal of Cognitive Education and Psychology. She is a frequent contributor to edited volumes on early childhood development, having recently authored chapters on the importance of parenting, on make-believe play and self-regulation, and on the kindergarten child. She has also written the article on social development for The Child: An Encyclopedic Companion; the article on Vygotsky for the Encyclopedia of Cognitive Science; and the chapter on storytelling as a teaching strategy for Voices of Experience: Memorable Talks from the National Institute on the Teaching of Psychology (Association for Psychological Science). She is the coauthor of the forthcoming chapter on make-believe play and self-regulation in the Sage Handbook of Play in Early Childhood. Berk’s books include Private Speech: From Social Interaction to Self-Regulation; Scaffolding Children’s Learning: Vygotsky and Early Childhood Education; Landscapes of Development: An Anthology of Readings; and A Mandate for Playful Learning in Preschool: Presenting the Evidence. In addition to Exploring Lifespan Development, she is author of the best-selling texts Child Development and Infants, Children, and Adolescents, and Development Through the Lifespan published by Pearson. Her book for parents and teachers is Awakening Children’s Minds: How Parents and Teachers Can Make a Difference. Berk is active in work for children’s causes. In addition to service in her home community, she is a member of the national board of directors and chair of the Chicago advisory board of Jumpstart, a nonprofit organization that provides intensive literacy intervention to thousands of low-income preschoolers across the United States, using college and university students as interveners. Berk is a fellow of the American Psychological Association, Division 7: Developmental Psychology.